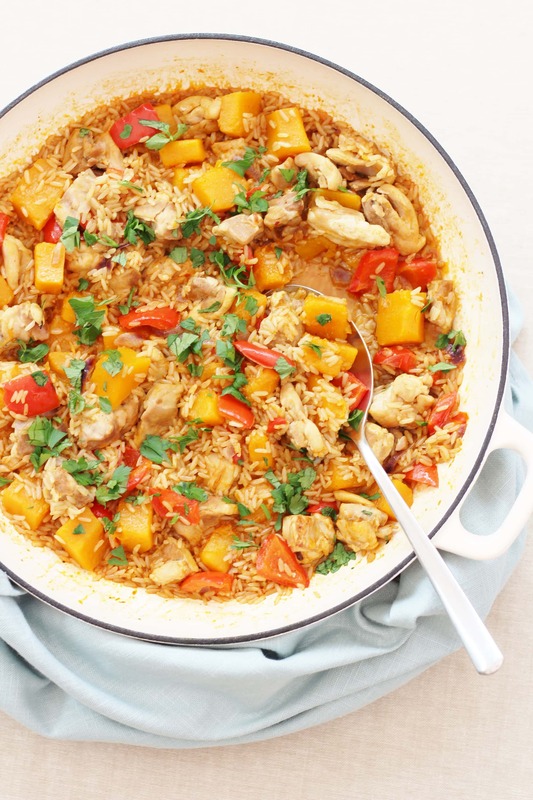 This easy peasy Harissa Chicken and Butternut Squash Pilaf takes less than 30 minutes to make and only uses one pan, yet tastes incredible. Perfect for busy days! Life has been super hectic lately, what with winning turkey awards, gadding about on photography and writing courses and then on Tuesday I spent the most amazing day at the River Cottage in Dorset (spoiler alert, no I didn’t get to meet HFW). Not to mention all the usual preparations for Christmas, the endless school related admin and also trying to sort things out for my daughter’s 8th birthday at the end of this month (Amazon must love me at the moment). Consequently I have been more in need than ever for easy midweek meal solutions! In particular, I’ve really been really getting into one pot rice dishes lately, inspired by Indian Biryanis and Middle Eastern Pilafs. They are incredibly easy to throw together and I really like only having one pot to wash up afterwards. 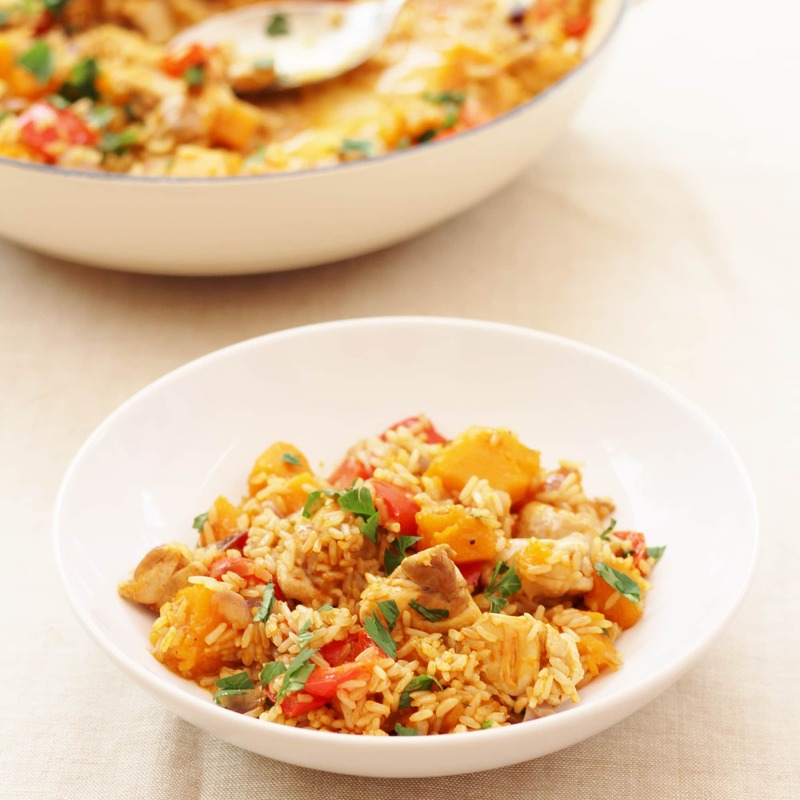 Plus I love how the rice absorbs all those delicious flavours. 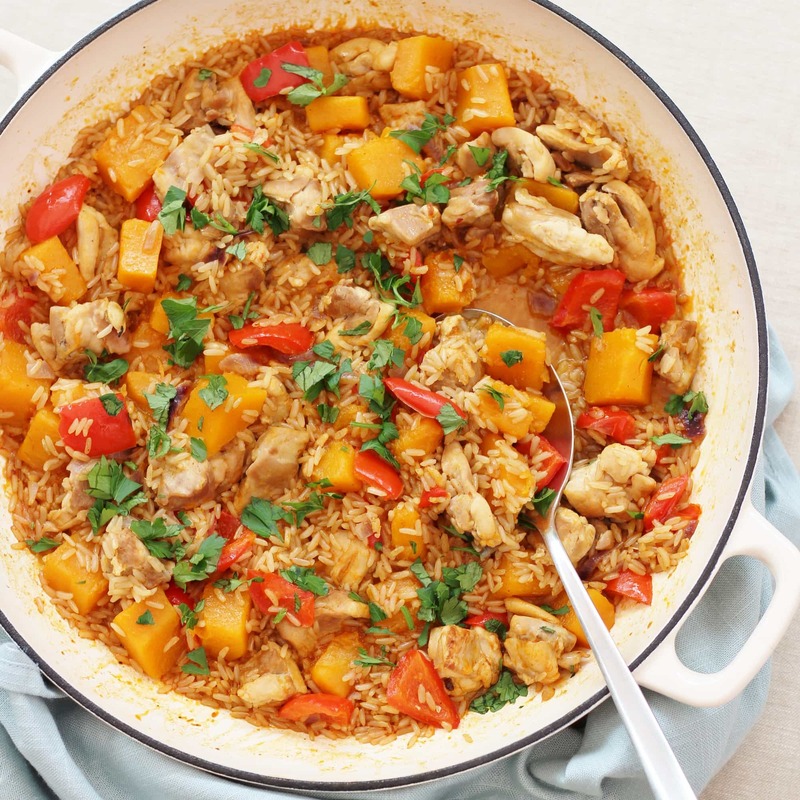 You can make this Harissa Chicken and Butternut Squash Pilaf in any large saucepan or deep frying pan, so long as you have some sort of lid or cover for it, but making this dish has given me the opportunity to use my latest acquisition…this rather gorgeous, cast iron, Le Creuset style sauté pan from M&S. So beautiful and so perfect for this style of cooking. 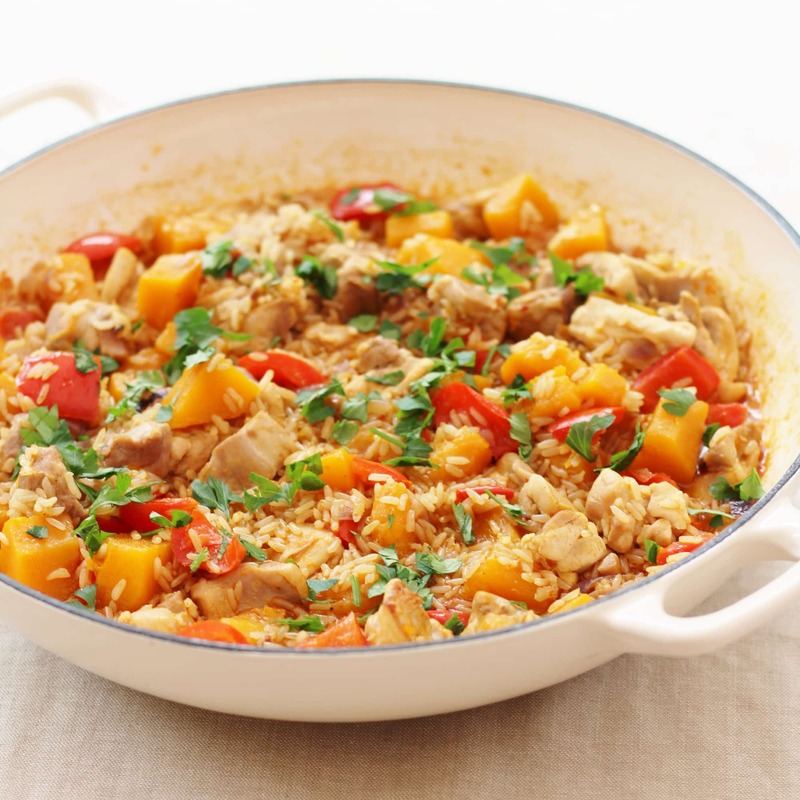 I have used my favourite skinless, boneless chicken thigh fillets in this recipe, but you can absolutely use diced chicken breast if you prefer, or substitute the chicken for chickpeas or another vegetable if you want to make this veggie – aubergine would work well here. 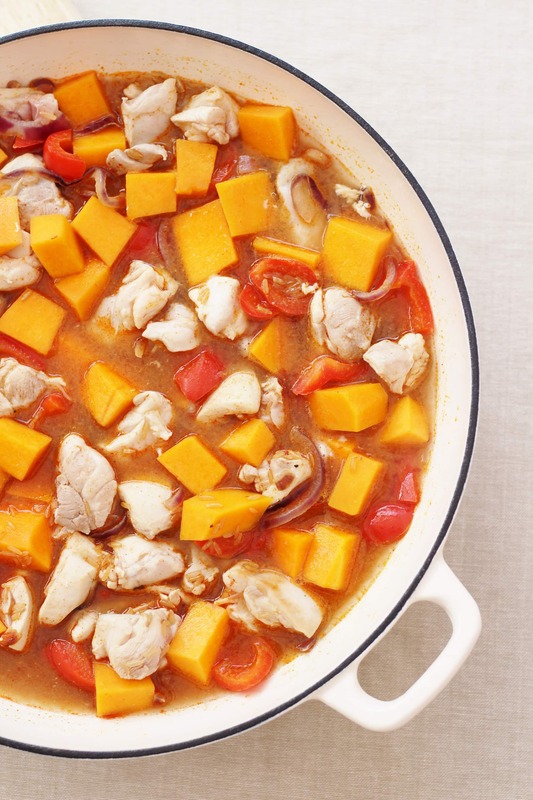 You could also substitute the butternut squash for pumpkin if you prefer…especially if you still have some left over from all the pumpkin carving activities last month!! For me this works well with a glass of Chilean or New Zealand Sauvignon Blanc, but you could also try a Spanish Garnacha red or rosé, if you prefer. 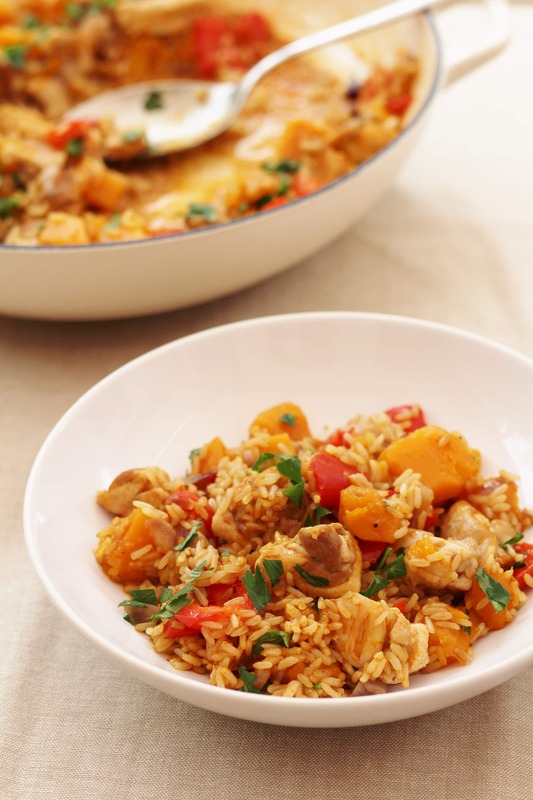 This easy peasy Harissa Chicken and Butternut Squash Pilaf takes less than 30 minutes to make and only uses one pan, yet tastes incredible. Place the olive oil, onions and peppers in a large frying pan or sauté pan and fry gently for 3 minutes with the lid on until softened, but not browned. Remove the lid and turn up the heat. Add the chicken and fry for 3 minutes or until the chicken and vegetables have browned a little. Add the harissa paste, butternut squash, stock and rice and mix together thoroughly. Bring to the boil, then turn down to a low simmer and cover with a lid. 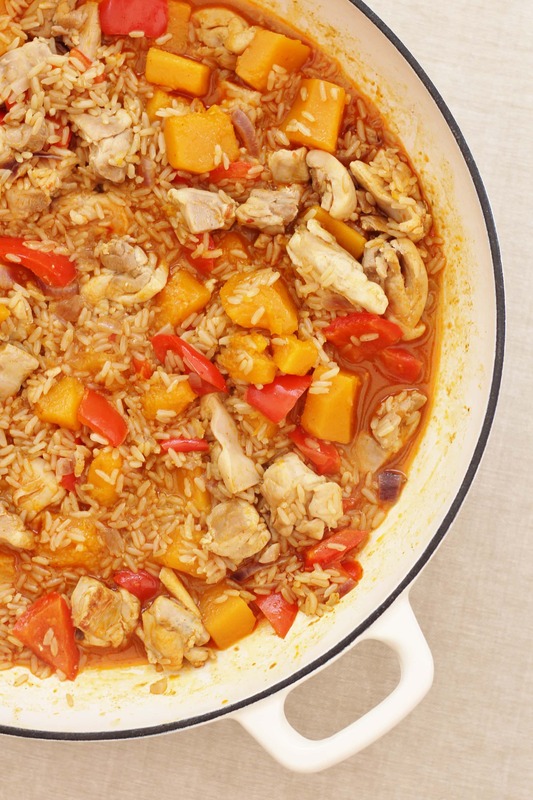 Cook for 20 minutes or until all the stock has been absorbed and the rice and butternut squash are tender. Add the parsley and serve scattered with more parsley and accompanied by a glass of Sauvignon Blanc or Garnacha. For a vegetarian version substitute the chicken for a 400g tin of chickpeas or a diced aubergine, and use vegetable stock instead of chicken stock. This looks yummy, Eb! And the pics are colorful and gorgeous! 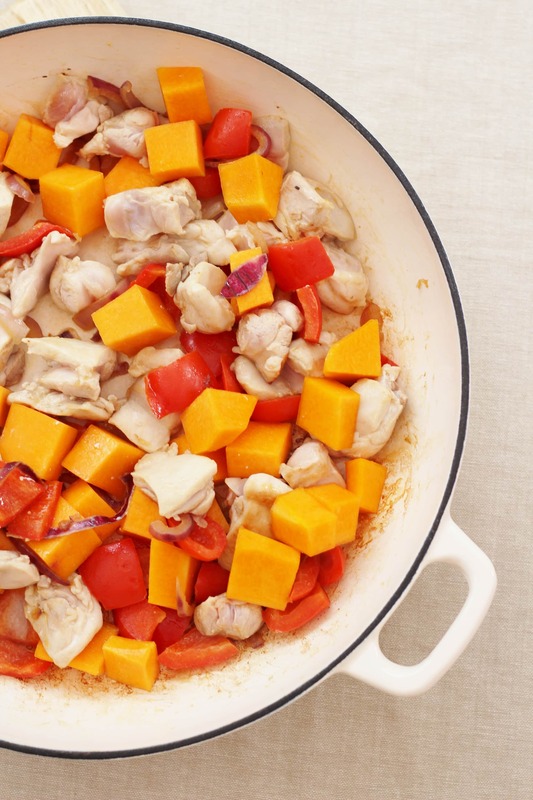 I love the idea of one pot recipe as it didn’t take me too much time to clean.